These polished finish cast bronze letters will have beautiful polished faces and bead blasted returns. Once your bronze letters are cast from prime ingot, sanded, blasted, and inspected, they are polished to an almost mirrored finish and then coated with an oven baked 2-part hardened acrylic polyurethane clear coat. The polished finish these bronze letters is very mirror-like. 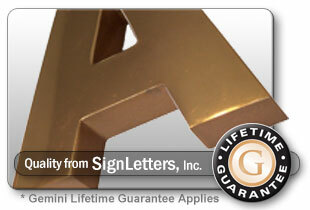 These cast metal letters are produced using Bronze alloy NAVY G (lead free - mercury free / US 9 finish).